New York – Over 200 “baby” galaxy clusters have been discovered by Astronomers which has turned out to be the largest number to have been found at one time. The discovery according to the astronomers will take them a long way in collecting clues about the nature of the dark matter, how it influences galaxies and how the galaxies eventually form and evolve. These baby galaxies as per what the astronomers explained are the “structural backbone of the universe” hence they have a big amount of both invisible and visible matter. They were formed three billion years and after the Big Bang 13.8 billion years ago. However, it is said that these clusters have not always existed. Astronomers used data from the now decommissioned Planck spacecraft to discover these faintly lit and very distant galaxies. The Planck has previously been usedat microwave and infra-red frequencies to detectanisotropies of the cosmic microwave background before becoming inactive in 2013. 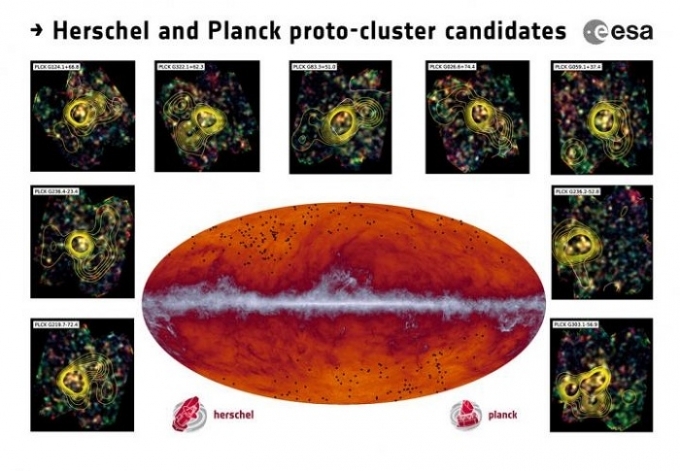 “It was such a surprise to us to find so many intensely star-forming, dust galaxies in such concentrated groups” said the lead author Hervé Dole who further expounded that this must have been one of the many missing pieces of cosmological structure formation. According to NASA, stars and galaxies were abundant in the early universe. They would however collapse under the weight of gravity which would lead to the creation of new galaxies and stars. The findings have since revealed that galaxies from the early universe can create stars from gas and dust basically at a rate of as many as 1,500 solar masses per year. On the other hand European Space Agency has explained that the Milky Way averages to about one solar mass per year. This simply means that every year, one star with the same weight as the sun is created from dust and gas. That said the age of the distant cluster is still to be determined according to Astrophysicists. The findings are published in the journal Astronomy & Astrophysics.